I have been eagerly looking forward to October, because it is Diverse Detectives Month hosted by Bina from If You Can Read This and Silicon from Silicon of the Internet. 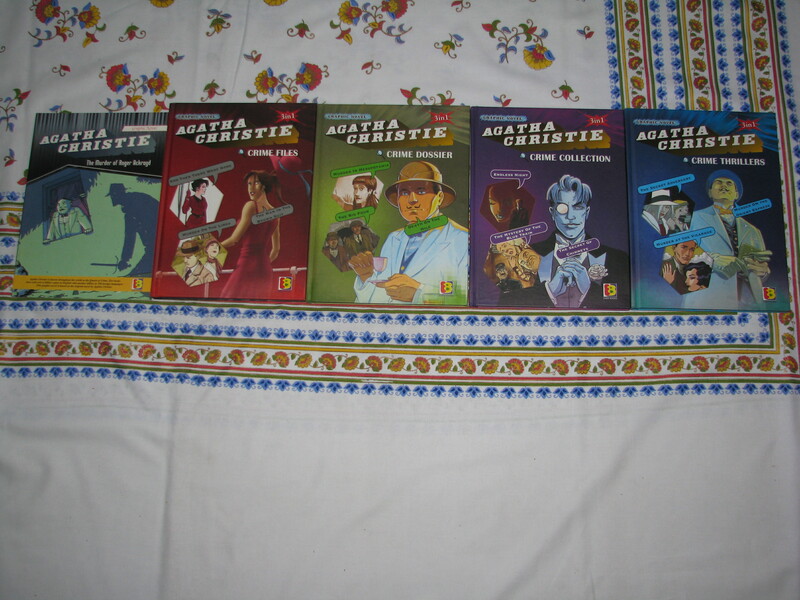 The phrase ‘Diverse Detectives’ is used in the sense that the detective in question is not a regular detective like Hercule Poirot or Sherlock Holmes or Miss Marple, but someone who is a person of colour (African, African-American, Chinese, Japanese, East Asian, Latin American, Persian, Arab, Native American, Indian etc.) or / and someone who is gay or who has a fluid sexual orientation, or LGBTQIA+ as the current acronym for that goes. I think it is easier to find the first kind of detective. It is hard to find the second kind. I will look forward to finding out what books other participants read especially with respect to the second kind of detective. I remember Pierce Brosnan saying sometime back that it was time for a black Bond, it was time for a gay Bond. I don’t know whether Bond will ever become black and / or gay, but I can definitely say that diverse detectives have arrived, if you look at the suggested reading list for the event. One of the fun parts of participating in a reading event is making reading plans. I always love making reading plans. Whether I stick to the plan or not is another matter 😂 I had a lot of fun making plans for this event. When my constantly evolving reading list finally took shape, I was so excited. Here it is. I am hoping to read some of these books over the next month. I divided the list into three parts as you can see. I got this book years back at an Indian version of the Parisian bouqiniste, or a platform bookshop, as we affectionately call it here. I had heard of Walter Mosley a few days back and as such things happen, a few days later the book leapt at me when I was browsing. The blue, red and white in the titles makes me think of the French national flag and its meaning and the Colours trilogy directed by Krzysztof Kieslowski. I don’t know whether Walter Mosley was trying to say something there. I loved the fact that these three colours are featured in the cover – I am sure that was intentional. I read the first few lines of the book and I am thinking that Walter Mosley might be the African-American Raymond Chandler and his detective Easy Rawlings might be the African-American Philip Marlowe. I will know when I finish reading the book. I have wanted to read this book for years. Can you believe that I haven’t read a single Alexander McCall Smith book? Time to remedy that. Can’t wait to read about the adventures of Precious Ramotswe, Botswana’s finest detective. One of my favourite friends gifted this book to me a while back and I have wanted to read it since. It features the seventy two year old coroner Dr.Siri Paiboun and is set in Laos. It promises to be a lot of fun. I first discovered this book through Eva from The Charm of It. And before I knew it, I started spotting it everywhere, like in the Diverse Detectives reading recommendations and Bina’s TBR list. It features the detective adventures of Blanche, who is a plump, fiesty, African-American housekeeper – how can one resist that. I have read just one story of Borges before. I have read that he was a master at taking a traditional detective story and turning it on its head. ‘Death and the Compass‘ is supposed to be the most famous of his ‘detective’ stories. I can’t wait to read that one and the others. I have had this book for years, since my Chinese days. I have never read a detective mystery set in China and so am very excited. These stories featuring the Indian detective Byomkesh Bakshi first appeared in the 1930s, and were originally written in Bengali. They are quite famous in India and have been adapted for TV. My Bengali friends rave about them and I can’t wait to read them. Satyajit Ray is one of India’s greatest filmmakers. But like many other artists, he was a man of many talents, and one of them was writing mysteries featuring the detective Feluda. The original stories were written in Bengali and first appeared in the 1960s and have delighted generations of Bengali readers, young and old alike. The collected Feluda stories come to around 1600 pages and I wouldn’t be able to read them all in one go. Hopefully I will be able to read some of them. I read my first Tamilvanan book when I was in my preteens and promptly fell in love with his works. Tamilvanan was probably the greatest detective mystery / crime fiction writer in Tamil in the twentieth century. He wrote from the ’50s to the late ’70s. He started his career writing literary fiction, but after a not-very-impressive start he shifted to crime fiction. (I don’t know why he didn’t hit it off as a literary fiction writer, because I have read his literary fiction and it is pretty good.) One of the fascinating things about Tamilvanan was his prose. He wrote Tamil which didn’t have the slant of any regional dialect. It didn’t have any English words. It wasn’t the way anyone spoke. It was the ideal version of Tamil, somewhat like the ideal version of the Queen’s English or the Parisian French. It was an absolute pleasure to read. I remember spending many an hour of my teen years taking in the delightful pleasures of Tamilvanan’s prose. Tamilvanan wrote books which spanned the complete range of crime fiction – detective mysteries, noir crime and every other genre in between. Half of his stories featured two detectives and the other half were standalone crime novels. His main detective was called Shankarlal. He was a combination of Sherlock Holmes, Hercule Poirot and James Bond – sometimes he would go to the crime scene and collect evidence and look for clues like Holmes did, at other times he would call everyone and sit inside a house and run thought experiments and solve the mystery like Poirot did and at other times he would be travelling to exotic locales and would be speeding away on boats with a damsel-in-distress in tow with the villains chasing them. When I think about it now, it all seems illogical and unbelievable, but when I read these books, I loved all the different facets of this detective hero. Tamilvanan was the inspiration for all the detective mystery / crime writers in Tamil who followed him. I don’t know how many books he wrote, but I think I have around a hundred of his books, all stocked up for a rainy day. Most of his books went out of print, and I got some of the last copies available. These days, his publishers are trying to bring some of his famous works back into print, which is great. ‘Manimozhi, Forget Me‘ is a crime novel. A father one day calls his twenty-something daughter and tells her that he is not the good guy she thinks he is, and bad guys are going to kill him, and he asks her to leave town. What he is, really, and what happens to the daughter forms the rest of the story. I read it the first time years back and it was gripping and page-turning like the best detective/ crime fiction is and I loved it. I can’t wait to read it again. My english translation of the title doesn’t really say anything about the story. I still remember the first scene – a man hires a boat in the night to take him to a ship, which is at the outer anchorage. While the boat is waiting quietly this man boards the ship. Ten minutes later he comes running across the ship’s deck being chased by gunmen, jumps from the ship onto the waiting boat and the boat speeds off to safety. It was a scene straight from a Bond movie. I loved it when I first read it. I can’t remember much of the story now except for that first scene. I hope to read it again and rediscover it. Devan was the Tamil Dickens. He wrote books about everyday middle class people, his descriptions of life were realistic and authentic and his stories were told with lots of humour. This is one of his famous works. Sambu is a clerk in a bank. He is forty years old. His boss calls him an idiot – in the sense, when his boss wants to speak to him, he tells his secretary – ‘Call that idiot.’ Sambu is frustrated with his life and his career, when one day surprising things happen. How this clerk becomes a detective – I can’t wait to find that. Sujatha was one of the great Tamil literary masters. His fans called him ‘Vaathiyaar‘ – an affectionate way of saying ‘Teacher‘. Detective mystery was one of the genres he wrote in. He also wrote literary fiction, feminist fiction, historical fiction, short stories, plays, nonfiction books on science for the general reader, literary essays, translation of ancient Tamil epics into modern Tamil and all kinds of things in between. He even wrote screenplays for movies. He was a true allrounder. His detective mysteries mostly featured the lawyer duo of Ganesh and Vasanth. They were probably modelled after Perry Mason. This is their most famous story. My translation of the title is not perfect – the original title ‘Kolaiyudhir Kaalam‘ can be more accurately translated to ‘The season in which people are murdered and drop dead like leaves during Autumn‘. I don’t know how to shorten that into a few words. I read this book years back and I remember it being a combination of murder mystery, paranormal, science and an unexpected ending. I can’t wait to read it again. So, this is my reading list for Diverse Detectives Month. Are you participating? Which books are you planning to read? The Read-a-thon day has started beautifully! This is the first time that I am doing the Read-a-thon and it is very exciting! It was tempting for me to change my planned book-list for the read-a-thon and include a YA book, a thriller and a graphic novel 🙂 I resisted the temptation though and stayed with my original list. I stared Ursula Le Guin’s ‘The Lathe of Heaven’ because it is the shortest book on my list 🙂 (184 pages). Have finished a little bit more than half of it (110 pages). Finished 150 pages of Ursula Le Guin’s ‘The Lathe of Heaven’. Wanted to finish the book by now, but have got distracted by a few things 🙂 It was heartening to see many cheerleaders stop by here! It has really boosted my morale and confidence for the rest of the day 🙂 I also went and cheered a few participants of the read-a-thon. The internet is buzzing with read-a-thon related discussions, cheering and mini-challenges! Am loving it! Thanks to all the cheerleaders for leaving comments and cheering me and keeping me going! Participated in two mini-challenges. Cheered a few fellow read-a-thon participants. Starting ‘The Wit of Cricket’ (by Barry Johnston). Don’t think I can complete this one. But hoping to come close to that as it is a light book. Finished 187 pages (out of 274 pages) of ‘TheWit of Cricket’ (compiled by Barry Johnston). It is the last few minutes of the read-a-thon. Thought I will check in and see how others are doing 🙂 Listened to Beatles ‘It’s been a hard day’s night’ post in the read-a-thon site 🙂 It really has been! Thanks to all the cheerleaders and friends and everyone else who dropped in and cheered me till the finish! 24-hour Read-a-thon on the 24th! My fellow book bloggers Michelle and Emily are participating in the Read-a-thon this year. I decided that I will do that too. It is scheduled for the coming Saturday (Oct 24). There seems to be a symmetry to it – a 24-hour read-a-thon on the 24th 🙂 I don’t know whether I will be able to read for 24 hours straight. I have not done an all-nighter in years. I will probably get up early and read till late, have lots of coffee in between, and have a short lunch and dinner and lock myself up in my room for the whole day and avoid all distractions. I don’t know whether it will work, but I am going to try. While I am reading, I will try to post my favourite lines from the book I am reading. I will also try to cheer fellow bloggers as they embark on this read-a-thon. 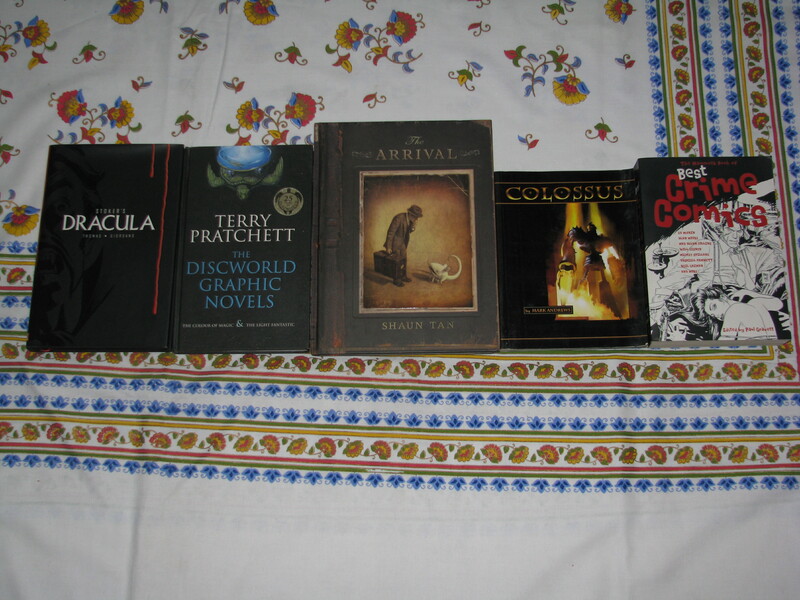 The following are the books that I have chosen to read during the read-a-thon. (Note : Alain De Botton is an interesting commentator on contemporary life. Looking forward to reading what he says about work). (Note : A history of cricket written in an easy conversational style). I will probably start with Ursula Le Guin’s ‘The Lathe of Heaven’ (it is the thinnest) and then read Simon Hughes’ ‘And God Created Cricket’ (I am hoping that it will be an easy read :)) If I still have time after this, I am planning to tackle one of the other three. If you want to participate in the read-a-thon, you can register here.